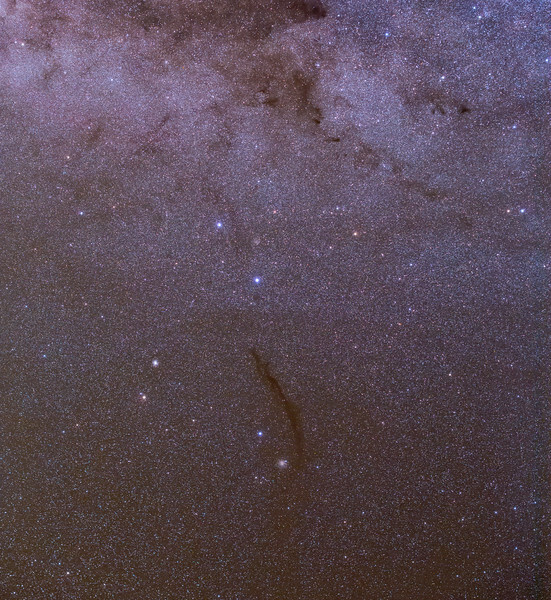 The Dark Doodad nebula is a molecular cloud in Musca where stars and planets can form. Hanging below the Southern Cross in the Chilean sky it is accompanied by globular cluster NGC 4372. Image taken by Lynn Hilborn, Atacama desert, Chile on April 16, 2018. CAnon 6d modified, Rokinon 135mm f2 lens at f2.8 18x 2mins 3200 ISO. iOptron ZEQ25 mount tracking only.